Apple has official announced most speculated iPhone OS 4.0 with much awaited multitasking feature. There are number of other features and APIs added to iPhone OS 4.0, the most important features can be found here. We know most of you want to know when you can get your hands on iPhone OS 4.0. Well normal users won’t get iPhone OS 4.0 before summer 2010 until then you have to wait patiently. 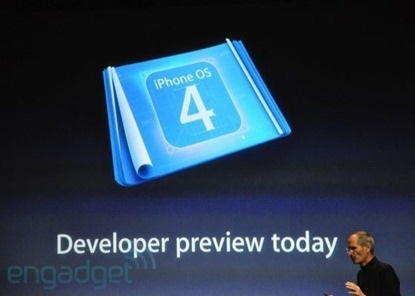 However developers can get hold of iPhone OS 4.0 developer preview version today itself. Use below link to download iPhone 4.0 OS dev preview version. You may want to know that iPhone 4.0 won’t fully support on iPhone 3G & iPod Touch 2G, it will likely run everything except multitasking.